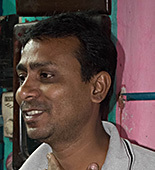 Born in 1978, 39 year old Bhaskar Chitrakar is the only active descendant today of the famed class of Kalighat patachitra painters, who lived and worked in the Kalighat temple area of Calcutta in the 19th century. Though Kalighat painting had become extinct by the 3rd decade or so of the 20th century, there were just a handful of painters who carried on with their tradition, on a small scale. They included Bhaskar`s forefathers and those of National Award winner Sirish Chandra Chitrakar, who was recognised as one of the last stalwarts who remembered the tradition, until his death in 1994. Bhaskar began his tutelage under his late father, Dulal Chitrakar from when he was six or seven. He was all of 13 when he completed his training and was able to handle an entire painting on his own, with some degree of dexterity, but he had also dropped out of school by then. Bhaskar was later also influenced by Sirish Chitrakar, whom he would observe at work. Other than painting patachitras, the Chitrakar community in Kalighat also made clay idols and Bhaskar continues to do so till this day - images of Durga and Kali mainly. He is also a self taught sculptor in fibre glass, having picked it up from regular visits to the Government College of Art and Craft, when he was eighteen or so. Even though he himself was not a student there, he was recognised as a fellow artist and allowed to observe. Most of the fibreglass sculptures made by him and his father before him, were bought by the Swaminarayan Akshardham Mandir in Gujarat. 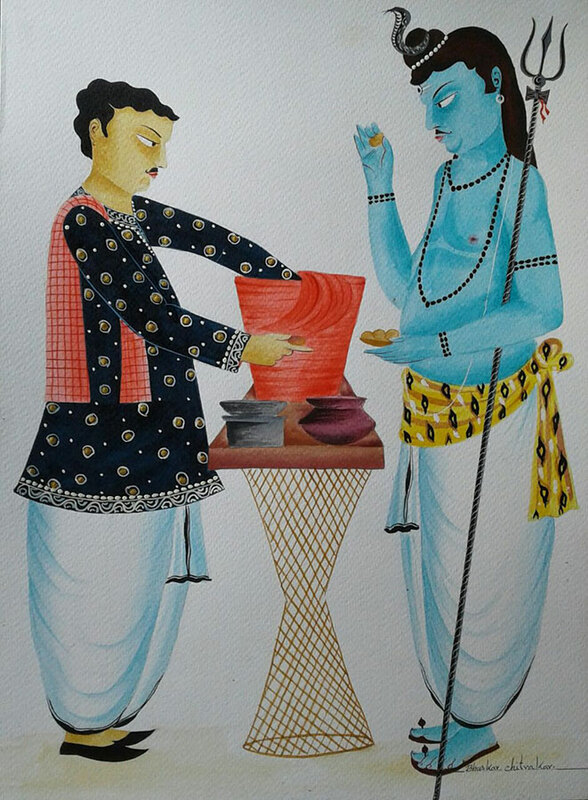 Bhaskar would earlier depend on both clay sculpting and Kalighat painting for his livelihood. But thanks to the renown he has garnered for his art in recent years, he is able to depend more on his paintings for his living. Fortunately for him, the burden of bearing the family`s expenses is shared between his brothers and himself - giving the talented Bhaskar ample scope to focus on his remarkable art. None of his brothers paint, but are idol makers. His father too had been unable to sustain himself on his art and depended primarily on his idol making income. Bhaskar is now able to paint about eight pictures a month and works only on orders. The subject of his paintings range from Babu culture themes to his own contemporary take on gods and goddesses, like Shiva eating phuchkas or Ganesh playing the dhak, to Frieda Kahlo look alikes. He rarely has a stock of ready paintings with him. He has never participated in government organized competitions and has won no awards. Yet his work speaks for itself. 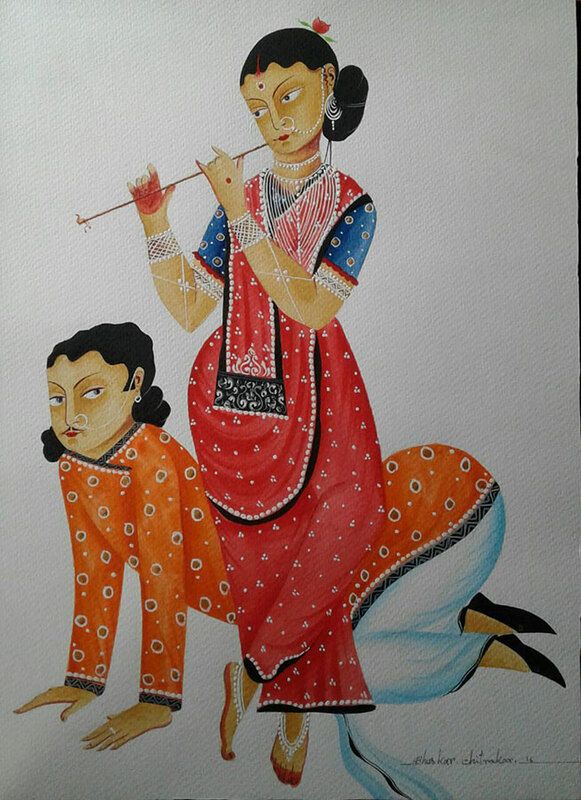 Bhaskar`s work is available in various galleries in Kolkata. Bhaskar, who is unmarried, trains his 12 year old nephew.